The cure for old monitors. Ever since VGA was introduced in the late 1980s on IBM’s PS/2 line, that 15-pin connector with the blue plastic cover has been the ultimate standard. Plugging in a monitor was always the easiest part of the operation, as pretty much every monitor worked with every computer. The computer usually even changed the resolution for you. We enjoyed 25 years of monitorial (is that a word?) bliss, but all things must end, and so did the reign of the VGA connector. While most monitors today have both a VGA and HDMI connection, making it possible to connect both new and old computers, today’s computers have ditched the VGA connector in favor of the smaller and more secure HDMI port… the same one found on your TV. That’s great if you do have a newer monitor, but if you’re in business you probably haven’t bought a lot of new monitors in a while… they tend to last a very long time. This leaves you with a bunch of new computers that won’t hook up to your old monitors. Help is here with the StarTech HD2VGAE2 adapter. 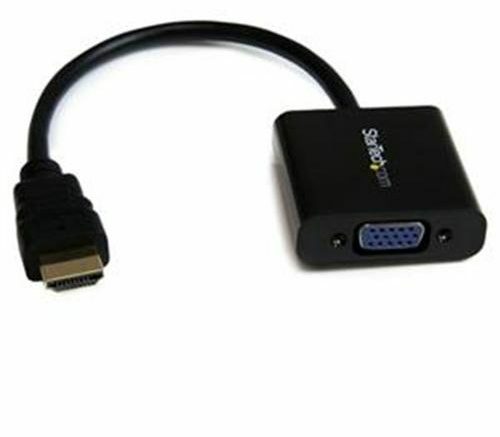 It may not have the sexiest name, but plug one of these babies into your computer’s HDMI port and you can connect it to any of those old VGA monitors you have laying around. That means you’ll save a hundred bucks or more on a new monitor. It also gives you the ability to run multiple monitors if you have both an HDMI AND VGA connection on your computer, and lets you use inexpensive HDMI splitters to put the same image on multiple monitors. This is one of those parts you’ll always be glad you have, and something that every mobile warrior should keep in a gadget bag. You never know when you’ll need to connect to a VGA device, whether it’s in a business center or hotel room.